2.1.3 From counts to probability. 2.4.3 Markov chain Monte Carlo. 3.2.1 Intervals of defined boundaries. 3.2.2 Intervals of defined mass. 4.2.1 Re-describing the globe tossing model. 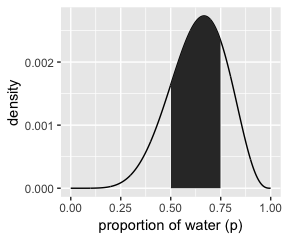 4.3.3 Grid approximation of the posterior distribution. 4.3.4 Sampling from the posterior. 4.3.5 Fitting the model with map() brm(). 4.3.6 Sampling from a map() brm() fit. 4.4.3 Interpreting the model fit. 5.4.3 Adding regular predictor variables. 5.4.4 Another approach: Unique intercepts. 6.1.1 More parameters always improve fit. 6.1.2 Too few parameters hurts, too. 6.2.3 From entropy to accuracy. 6.2.4 From divergence to deviance. 6.2.5 From deviance to out-of-sample. 6.4.3 DIC and WAIC as estimates of deviance. 7.1.1 Adding a dummy variable doesn’t work. 7.1.2 Adding a linear interaction does work. 7.1.4 Interpreting an interaction estimate. 7.2 Symmetry of the linear interaction. 7.2.2 Africa depends upon ruggedness. 8.3.3 Sampling again, in parallel. 8.4 Care and feeding of your Markov chain. 8.4.1 How many samples do you need? 8.4.2 How many chains do you need? 8.4.3 Taming a wild chain. 9.2.2 Linking linear models to distributions. 10.1.1 Logistic regression: Prosocial chimpanzees. 10.1.2 Aggregated binomial: Chimpanzees again, condensed. 10.1.3 Aggregated binomial: Graduate school admissions. 10.1.4 Fitting binomial regressions with glm(). 10.2.1 Example: Oceanic tool complexity. 10.2.3 Example: Exposure and the offset. 11.1.2 Describing an ordered distribution with intercepts. 11.1.4 Bonus: Figure 11.3 alternative. 11.3.3 Over-dispersion, entropy, and information criteria. 12.2.2 Assign values to the parameters. 12.2.4 Compute the no-pooling estimates. 12.2.5 Compute the partial-pooling estimates. 12.3.2 Two types of cluster. 12.4.1 Posterior prediction for same clusters. 12.4.2 Posterior prediction for new clusters. 12.4.3 Focus and multilevel prediction. 13.1.3 The varying slopes model. 13.2.2 Varying effects of being male. 13.4.1 Example: Spatial autocorrelation in Oceanic tools. 13.5 Summary Bonus: Another Berkley-admissions-data-like example. 14.1.1 Error on the outcome. 14.1.2 Error on both outcome and predictor. We’ll do so within a tibble. Here’s the other way of tackling the vampire problem, this time useing the frequency format. Here we use grid approximation, again, to generate samples. # how many grid points would you like? ##  1  0         1   0. 0. Now we’ll use the dplyr::sample_n() function to sample rows from d, saving them as sample. # how many samples would you like? We’ll plot the zigzagging left panel of Figure 3.1 with geom_line(). But before we do, we’ll need to add a variable numbering the samples. We’ll make the density in the right panel with geom_density(). “Once your model produces a posterior distribution, the model’s work is done. But your work has just begun. 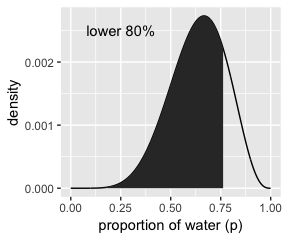 It is necessary to summarize and interpret the posterior distribution. Exactly now it is summarized depends upon your purpose” (p. 53). 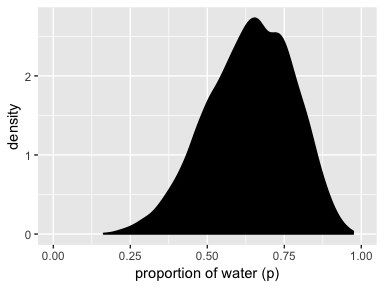 To get the proportion of water less than some value of p_grid within the tidyverse, you’d first filter() by that value and then take the sum() within summarise(). To learn more about dplyr::summarise() and related functions, check out Baert’s Data Wrangling Part 4: Summarizing and slicing your data and Chapter 5.6 of R4DS. If what you want is a frequency based on filtering by samples, then you might use n() within summarise(). You can use & within filter(), too. We’ll create the upper two panels for Figure 3.2 with geom_line(), geom_ribbon(), and a some careful filtering. We’ll come back for the lower two panels in a bit. 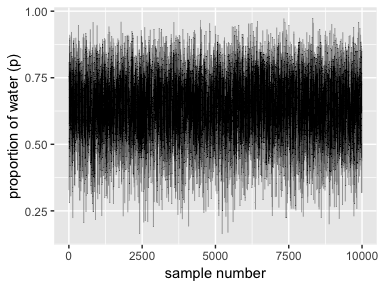 Since we’ve saved our p_grid samples within the well-named samples tibble, we’ll have to index with $ within quantile. And we might also use quantile() within summarise(). The tydiverse approach is nice in that that family of functions typically returns a data frame. But sometimes you just want your values in a numeric vector for the sake of quick indexing. In that case, base R quantile() shines. Now we have our cutoff values saved as q_80 and q_10_and_90, we’re ready to make the bottom panels of Figure 3.2. We’ve already defined p_grid and prior within d, above. Here we’ll reuse them and update the rest of the columns. The rethinking::PI() function works like a nice shorthand for quantile(). 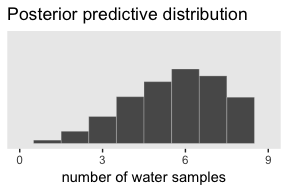 Now’s a good time to introduce Matthew Kay’s tidybayes package, which offers an array of convenience functions for Bayesian models of the type we’ll be working with in this project. The tidybayes package offers a family of functions that make it easy to summarize a distribution with a measure of central tendency accompanied by intervals. With median_qi(), we asked for the median and quantile-based intervals–just like we’ve been doing with quantile(). Note how the .width argument within median_qi() worked the same way the prob argument did within rethinking::PI(). 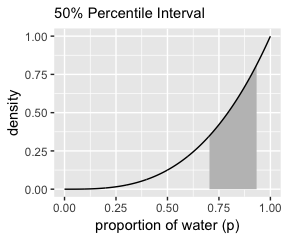 With .width = .5, we indicated we wanted a quantile-based 50% interval, which was returned in the ymin and ymax columns. The tidybayes framework makes it easy to request multiple types of intervals. E.g., here we’ll request 50%, 80%, and 99% intervals. The .width column in the output indexed which line presented which interval. 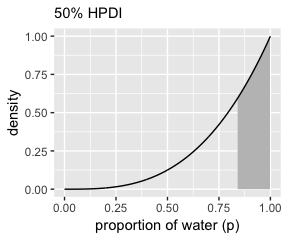 Now let’s use the rethinking::HPDI() function to return 50% highest posterior density intervals (HPDIs). 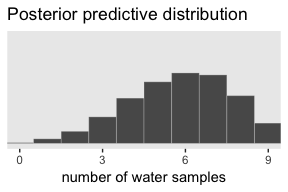 The reason I introduce tidybayes now is that the functions of the brms package only support percentile-based intervals of the type we computed with quantile() and median_qi(). But tidybayes also supports HPDIs. This time we used the mode as the measure of central tendency. With this family of tidybayes functions, you specify the measure of central tendency in the prefix (i.e., mean, median, or mode) and then the type of interval you’d like (i.e., qi or hdi). If all you want are the intervals without the measure of central tendency or all that other technical information, tidybayes also offers the handy qi() and hdi() functions. These are nice in that they yield simple numeric vectors, making them particularly useful to use as references within ggplot2. Now we have that skill, we can use it to make Figure 3.3. We’ve been calling point estimates measures of central tendency. If we arrange() our d tibble in descending order by posterior, we’ll see the corresponding p_grid value for its MAP estimate. To emphasize it, we can use slice() to select the top row. Or we could use the handy dplyr::top_n() function. We can get th emode with mode_hdi() or mode_qi(). But if all you want is the mode itself, you can just use tidybayes::Mode(). But medians and means are typical, too. We can inspect the three types of point estimate in the left panel of Figure 3.4. First we’ll bundle the three point estimates together in a tibble. As it turns out “different loss functions imply different point estimates” (p. 59, emphasis in the original). What McElreath did with sapply(), we’ll do with purrr::map(). If you haven’t used it, map() is part of a family of similarly-named functions (e.g., map2()) from the purrr package, which is itself part of the tidyverse. The map() family is the tidyverse alternative to the family of apply() functions from the base R framework. You can learn more about how to use the map() family here or here or here. Now we’re ready for the right panel of Figure 3.4. We saved the exact minimum value as min_loss, which is 0.841. 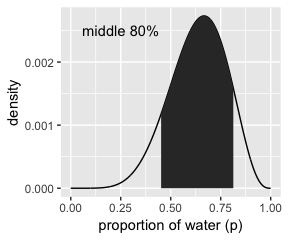 Within sampling error, this is the posterior median as depicted by our samples. The quadratic loss \((d - p)^2\) suggests we should use the mean instead. Let’s investigate. Based on quadratic loss \((d - p)^2\), the exact minimum value is 0.8. 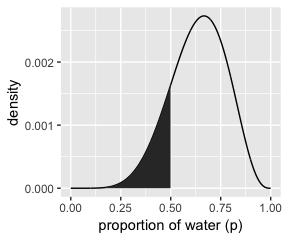 Within sampling error, this is the posterior mean of our samples. If we’re going to simulate, we should probably set our seed. Doing so makes the results reproducible. Here are ten reproducible draws. Now generate 100,000 (i.e., 1e5) reproducible dummy observations. # how many would you like? As McElreath mused in the text, those simulated proportion values are very close to the analytically calculated values in our density column a few code blocks up. Here’s the simulation updated so \(n = 9\), which we plot in our version of Figure 3.5. McElreath suggested we play around with different values of size and prob. With the next block of code, we’ll simulate nine conditions. If you’re new to applied statistics, you might be surprised how often mistakes arise. 3.3.2.1 Did the software work? Let this haunt your dreams: “There is no way to really be sure that software works correctly” (p. 64). If you’d like to dive deeper into these dark waters, check out one my favorite talks from StanCon 2018, Esther Williams in the Harold Holt Memorial Swimming Pool, by the ineffable Dan Simpson. If Simpson doesn’t end up drowning you, see Gabry and Simpson’s talk at the Royal Statistical Society 2018, Visualization in Bayesian workflow, a follow-up blog Maybe it’s time to let the old ways die; or We broke R-hat so now we have to fix it, and that blog’s associated pre-print by Vehtari, Gelman, Simpson, Carpenter, and Bürkner Rank-normalization, folding, and localization: An improved Rˆ for assessing convergence of MCMC. 3.3.2.2 Is the model adequate? The implied predictions of the model are uncertain in two ways, and it’s important to be aware of both. First, there is observation uncertainty. For any unique value of the parameter \(p\), there is a unique implied pattern of observations that the model expects. These patterns of observations are the same gardens of forking data that you explored in the previous chapter. These patterns are also what you sampled in the previous section. There is uncertainty in the predicted observations, because even if you know \(p\) with certainty, you won’t know the next globe toss with certainty (unless \(p = 0\) or \(p = 1\)). Second, there is uncertainty about \(p\). 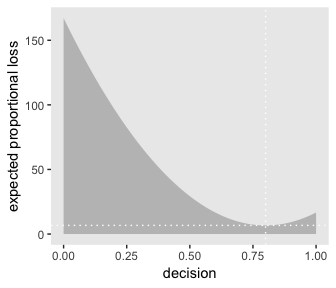 The posterior distribution over \(p\) embodies this uncertainty. And since there is uncertainty about \(p\), there is uncertainty about everything that depends upon \(p\). The uncertainty in \(p\) will interact with the sampling variation, when we try to assess what the model tells us about outcomes. All this is depicted in Figure 3.6. To get ready to make our version, let’s first refresh our original grid approximation d.
We can make our version of the top of Figure 3.6 with a little tricky filtering. 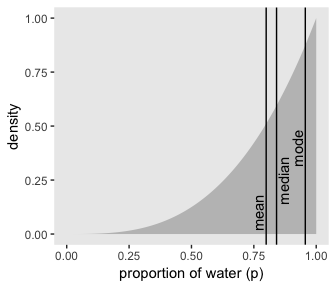 Note how we weighted the widths of the vertical lines by the posterior density. We’ll need to do a bit of wrangling before we’re ready to make the plot in the middle panel of Figure 3.6. Now we’re ready to plot. To make the plot at the bottom of Figure 3.6, we’ll redefine our samples, this time including the w variable (see the R code 3.26 block in the text). would be the disaggregated version of just one of the numerals returned by rbinom() when size = 9. So let’s try simulating again with un-aggregated samples. We’ll keep adding to our samples tibble. In addition to the disaggregated draws based on the \(p\) values listed in p_grid, we’ll also want to add a row index for each of those p_grid values–it’ll come in handy when we plot. The main action is in the draws column. Now we have to count the longest sequences. The base R rle() function will help with that. Consider McElreath’s sequence of tosses. You can plug that into rle(). ##   values : chr [1:7] "w" "l" "w" "l" "w" "l" "w"
For our purposes, we’re interested in lengths. 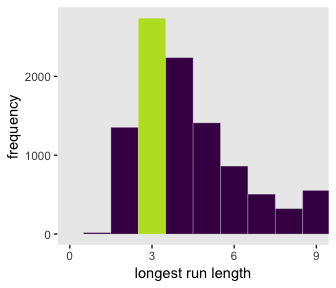 That tells us the length of each sequences of the same value. The 3 corresponds to our run of three ws. The max() function will help us confirm it’s the largest value. Now let’s apply our method to the data and plot. Let’s look at rle() again. We can use the length of the output (i.e., 7 in this example) as the numbers of switches from, in this case, “w” and “l”. With that new trick, we’re ready to make the right panel of Figure 3.7. In brms, we’ll fit the primary model of \(w = 6\) and \(n = 9\) much like we did at the end of the project for Chapter 2. We’ll learn more about the beta distribution in Chapter 11. But for now, here’s the posterior summary for b_Intercept, the probability of a “w”. As we’ll fully cover in the next chapter, Estimate is the posterior mean, the two Q columns are the quantile-based 95% intervals, and Est.Error is the posterior standard deviation. Much like the way we used the samples() function to simulate probability values, above, we can do so with fitted() within the brms framework. But we will have to specify scale = "linear" in order to return results in the probability metric. By default, brms::fitted() will return summary information. Since we want actual simulation draws, we’ll specify summary = F.
By default, we have a generically-named vector V1 of 4000 samples. We’ll explain the defaults in later chapters. For now, notice we can view these in a density. Looks a lot like the posterior probability density at the top of Figure 3.6, doesn’t it? 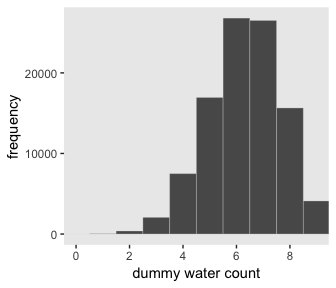 Much like we did with samples, we can use this distribution of probabilities to predict histograms of w counts. With those in hand, we can make an analogue to the histogram in the bottom panel of Figure 3.6. As you might imagine, we can use the output from fitted() to return disaggregated batches of 0s and 1s, too. 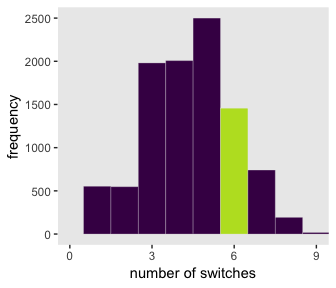 And we could even use those disaggregated 0s and 1s to examine longest run lengths and numbers of switches as in the analyses for Figure 3.7. I’ll leave those as exercises for the interested reader. McElreath, R. (2016). 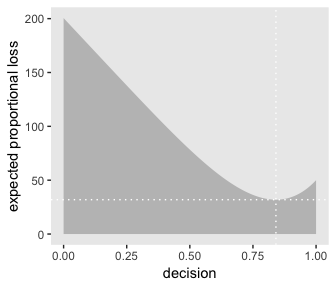 Statistical rethinking: A Bayesian course with examples in R and Stan. Chapman & Hall/CRC Press.